Having the right kind of material handling equipment to get things around a warehouse or factory makes a real difference to how efficiently the unit can operate, and also ensures that the raw materials and finished items are carried in the safest way possible. By following a strategy that places the maximum emphasis on having the right equipment to carry every kind of martial around your facility, you can ensure that wherever possible you are able to protect staff and product to the highest level. Damage to goods and equipment caused by improperly handled materials is one of the most avoidable costs in the modern workplace, so by using appropriate materials handling equipment, you will be able to reduce costs in this area, and increase profit. Different kinds of material need special care to protect them when they are being moved around, so consider the various areas of your business when tooling up, and you can be sure that your workplace will operate at its optimum levels. The proper disposal of waste from the factory floor is one of the main areas where proper material handling equipment is essential. 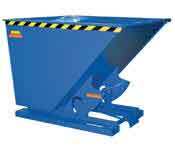 Self tipping hoppers that attach to standard fork lifts allow for staff to have a convenient place to dump waste without having to go too far from their workstation. When the hopper is full, the forklift can pick up the unit and move it safely out of the shop floor environment, and then dispose of it in accordance with the relevant guidelines. The whole process of removing any spoil is then streamlined, and valuable production time is maximized for all workers. When you need to be able to lift heavy weights from floor level in order to place them on workbenches, proper cranes are important, and there are a variety of different solutions available to you from Easy Rack. 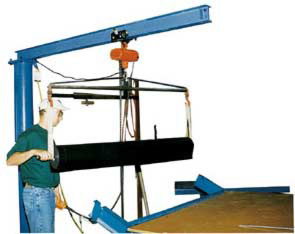 Popular options include gantry cranes. 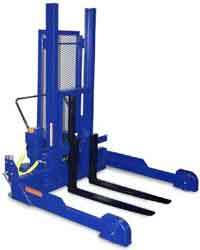 These offer the ability to lift weights of up to 2,000lb without any problems, and if a motorized lifting system is employed, any staff member will find it easy to get material into a position where it can be properly worked on. Jib cranes are an alternative to gantries when it comes to choosing material handling equipment for lifting heavy masses, and with both static and moveable options available, the most important consideration that you need to make is the power of the lifting system that you choose to ensure that it strikes the right balance between strength and cost. Simple hand trucks are a common sight in factories around the world, and allow staff to safely maneuver heavy crates and drums from one area to another. Choose a unit with sturdy wheels and a high quality base that can withstand the strain of whatever you need to move, and you will be rewarded with a truck that will last for many years, and come in very handy throughout the workplace. Whatever material handling equipment you need for your business, safety should always be your primary consideration, and staff should all be fully trained in the use of any products that they need, as this will minimize the risk of them damaging items or injuring their colleagues unnecessarily. As you continue to read through our selection of material handling equipment, keep in mind we stand ready to answer any questions you may have about our offerings. Call us at 1-888-776-3720 whenever such questions arise and let us help you make the best investment within your budget. We are located in Houston, Texas.